47st.photo has no other items for sale. There are 4,036 items available. Please enter a number less than or equal to 4,036. Sales tax may apply when shipping to: IA*, MN*, NY*(8.875%), PA*(6.0%), WA*. There is a lot to like about this toothbrush. It has a nice high vibration and cleans well. Feels like a trip to the hygienist to get my teeth cleaned every day. I also like that I can use rechargeable batteries so I'm not throwing the disposable toothbrushes with enclosed batteries away. The bad news is the brush head is way too small. It's very hard to keep the bristles on my teeth without getting the shaft touching my teeth also. That hard vibration is quite unpleasant. A larger bristle head would go a long way to a five star product. Anyone know of an after market head that is larger? lets start out by saying it cleans great..perfect size head on brush..alot of power..Power is when i almost didnt like it because i have two crowns and i thought it was going to nock one loose..If you close your mouth a little bit it rattles your teeth...If you have no fake teeth its a great toothbrush..
Works great wish i bought one years ago.I dont think i would ever to back to a manual toothbrush. Incredible price on an excellent product! This is my first electric toothbrush and I am very impressed. 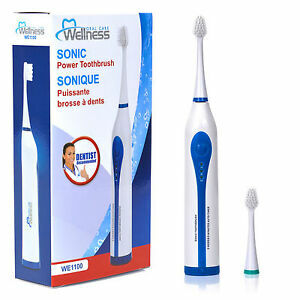 The high speed action, well balanced design really refresh the mouth and gums!! The reminder tones are helpful in making the "brushing" process effective and efficient. Works well. I ordered two and neither came with travelers cap.It featured a travelers cap and that was one of the main reasons I purchased two but when I received them they were not in box.